What’s the next best thing to an After Tour? A Before Tour, of course! Well, at least it is when you can visualize the end result! We did our best to measure here and the numbers aren’t exact, but they’re pretty close. The house is just over 1400 square feet, plus an enclosed sunroom/porch in the back. 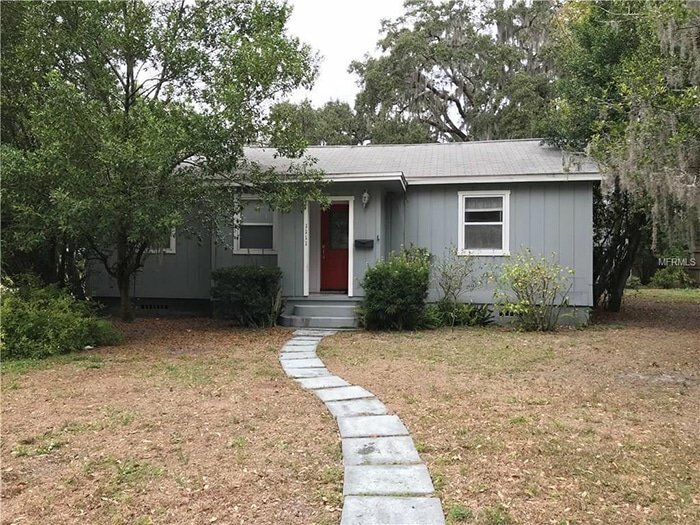 It’s a 3 bedroom, 2.5 bath built in the 1940’s. 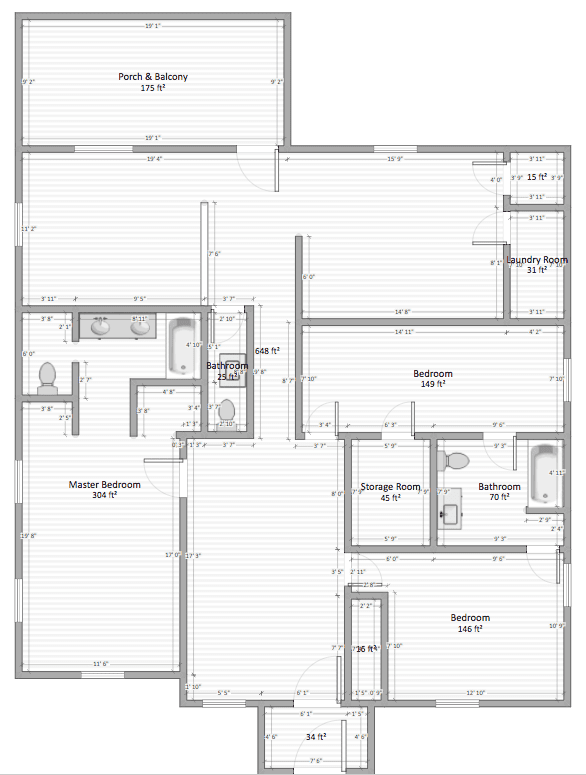 The current floor plan is pretty chopped up, with two potential living rooms that are too small to be functional. The kitchen is a decent size, but it’s galley style and at the end of the hallway, closed off from the rest of the house. 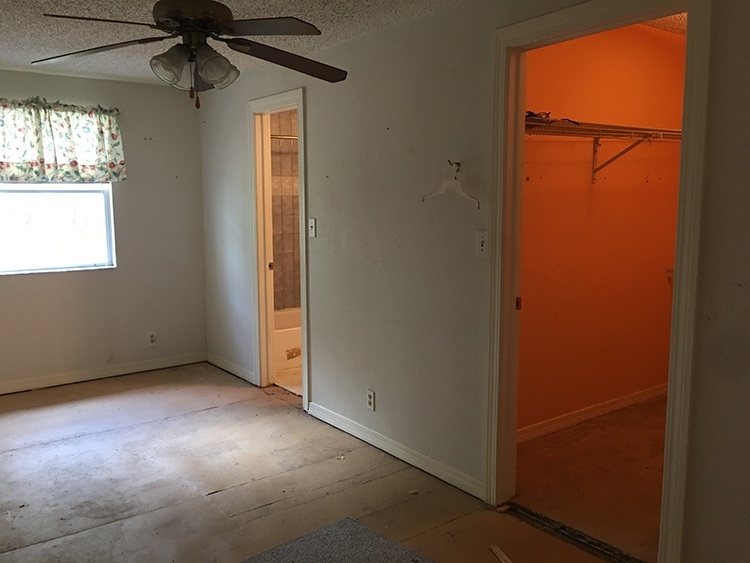 The biggest change will be to open up the space by removing the small half bathroom in the center of the house, and eliminating the narrow third bedroom just across from that. A third bathroom isn’t necessary in a house this size, and we will enclose one of the second living rooms (in the top left) so it becomes the new third bedroom. The old narrow bedroom and closet will become part of the open living space, and the back of the old bedroom will become a new laundry room. The horizontal wall in the center of the home is load bearing (it was originally the exterior wall) so we’ll build a header to support the part we’re removing, along with decorative vertical columns. The master bedroom/bathroom and the front bedroom/bathroom will stay pretty much the same. 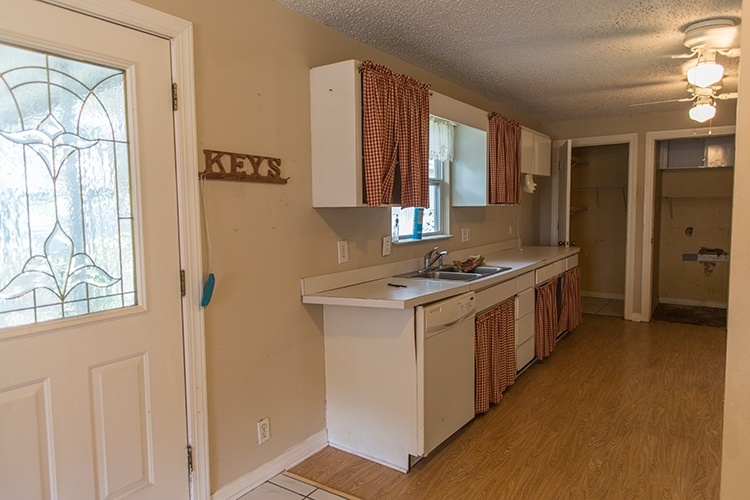 In the kitchen, we’ll remove the existing pantry closet and laundry room, and extend the new cabinets all the way to that wall. Bonus: it comes with a detached 2 car garage and a large storage shed! We aren’t going to focus on the exterior for a while, though. The plan is to have the main living areas completed (living room/dining/kitchen) before we move in, in July. Back to the front of the house. 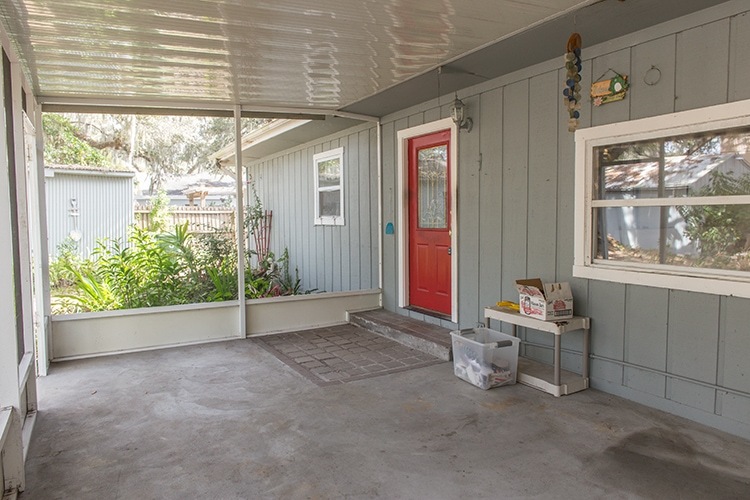 Currently there’s a small enclosed entryway with a screen door, which I’d like to become the new front door. 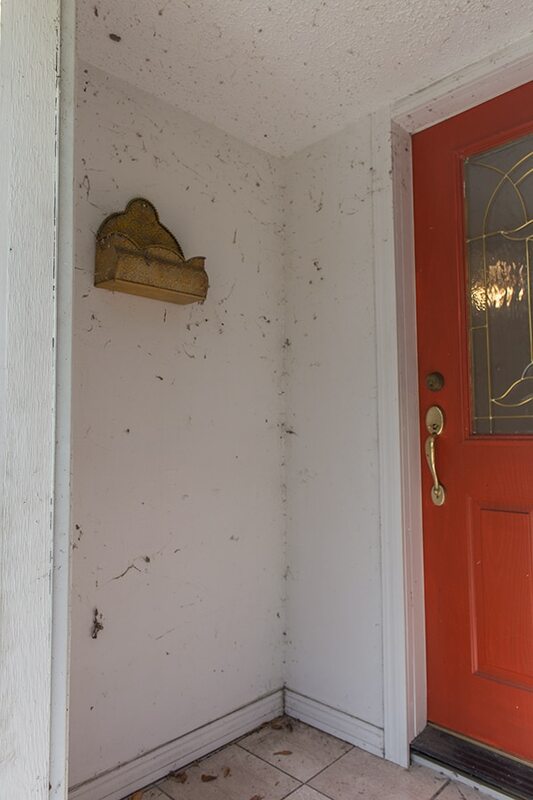 The porch will become an interior foyer/entryway area with hooks and a storage bench. New view from inside the living room! I’m using the free Homestyler app for these. 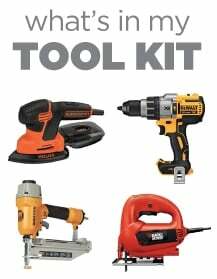 It’s great for spacial planning, but very limited on decor and finishes, so ignore all of that—this is just to get a general idea. 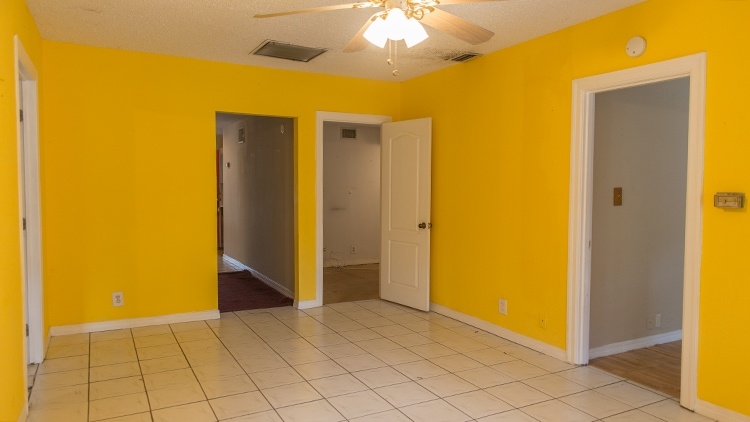 It’s yellow! The color of sunshine and happiness, right? Let me tell you, felt great to sledgehammer that thing a few days ago (demo coverage coming soon). 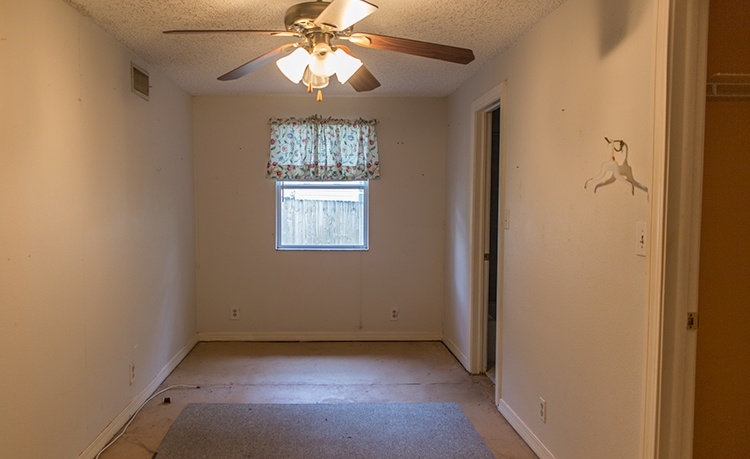 The room is not in the best of shape, and we actually plan to rip all of the overly-textured drywall out because it’s easier to replace than mudding and sanding it all down to a flat finish. 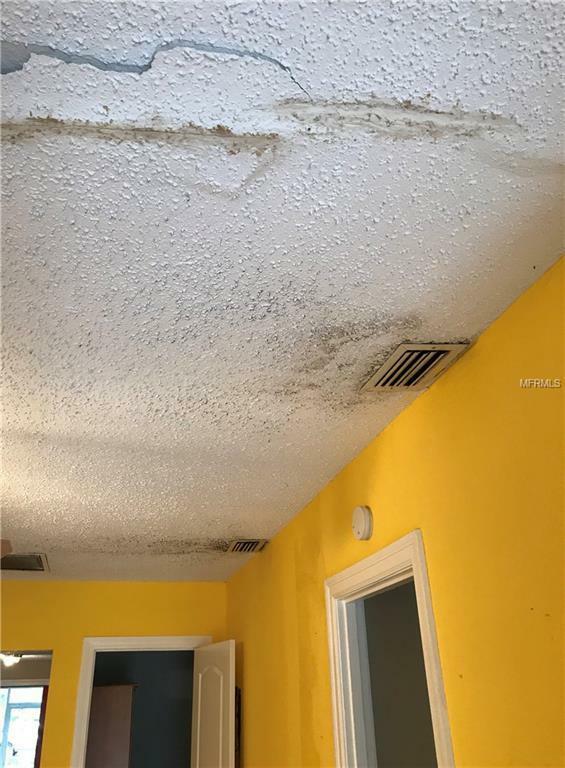 Cracked popcorn ceilings are going bye-bye too. The biggest change in here will be the layout—the entire back wall will be gone! On the left wall will be an office/study (hopefully with built-ins one day) and just beyond that will be the new living room. The door on the far right (below) leads to the front bedroom, which will stay the same. 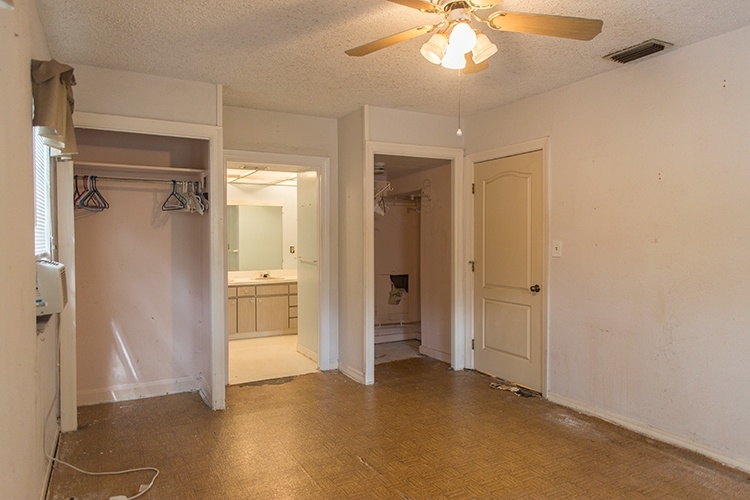 The next door on the left leads to a narrow third bedroom, which will be eliminated, with half the space used for the living room, and the other half for a new laundry room. The hallway leads to the kitchen and that wall will be gone, and the space to the left is the half bathroom which will also be gone. The far left door leads to the master bathroom, and that will stay. 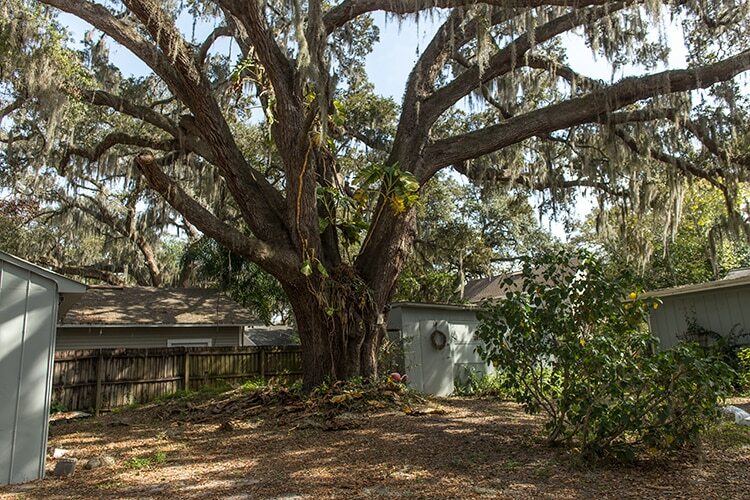 This house will feel so much larger! 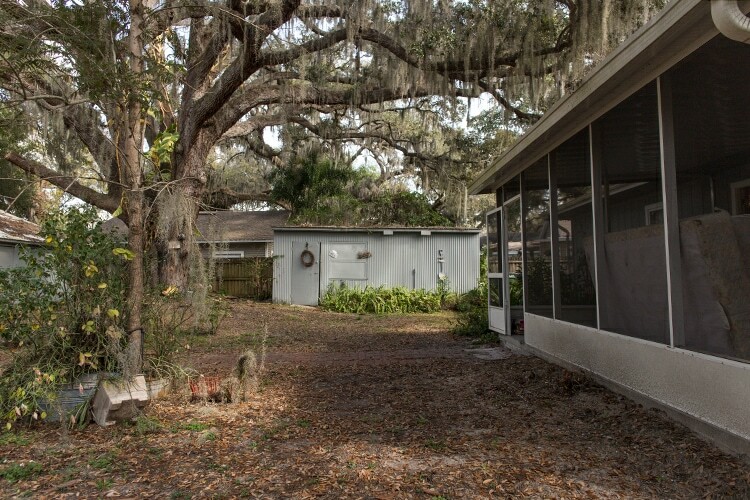 That back wall is load bearing (it’s actually the original exterior wall of the home!) so we’ll add a header to support the section we’re removing (almost 18′), and add decorative vertical columns on either side for architectural interest. Across the hall from that is the kitchen. 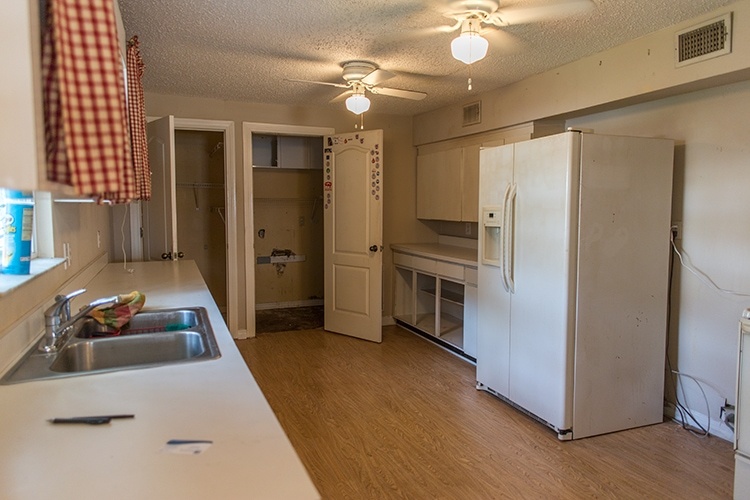 It’s a decent sized kitchen, but we’ll be eliminating the pantry and laundry room on the back wall to gain a few more feet. Again, ignore the finishes (this program only has one range hood to choose from!) but this is our general idea for the layout. We want to add a wall of windows above the sink to allow plenty of light. To the right of the kitchen will be a door to the new pantry (currently the back of the narrow bedroom). That creepy pink glowing wall will be the new back wall of the living room, where the TV sits. This might actually be the largest bathroom I’ve ever owned! Nothing special here. It’s basically your most average bedroom in the world. 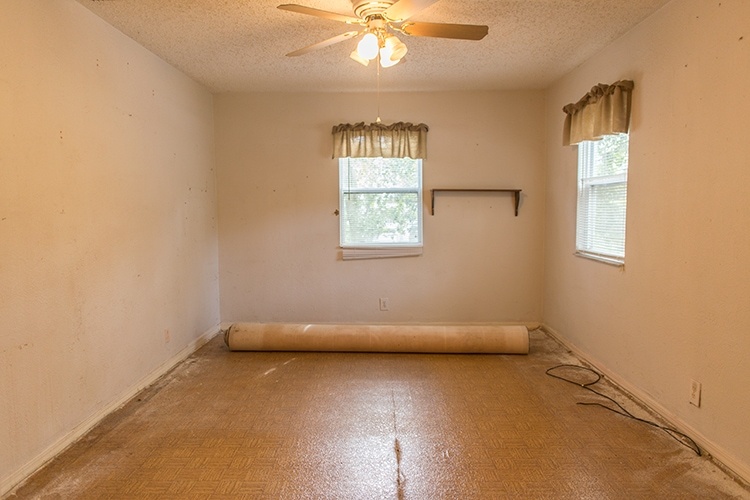 But it’ll make a cozy guest room someday. Exiting the guest bedroom takes you right back out into the entrance/study area. And on the other side of the study, we have our master bedroom. It’s long and narrow—not the easiest shape to work with. Definitely can’t fit a King sized bed or a dresser in here (don’t let the wide angle lens fool you). Once again—the drawing is just for scale & reference. 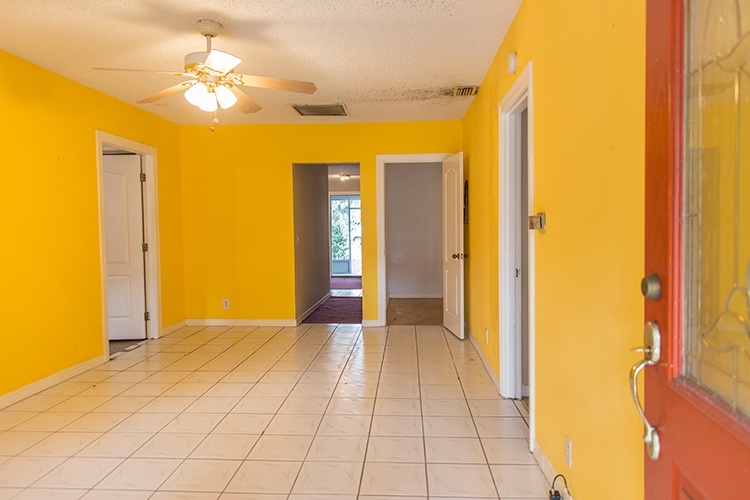 On the opposite side of the room are two closets and a bathroom. The bathtub will have to be moved in by around 12″, because right now it’s cutting into where the new living room will be, but it’s still a nice sized bathroom. Haven’t even started thinking about the remodel in here yet—that will come in the future. If we go back out into the living room and turn left, you’ll end up at the door of the new third bedroom. 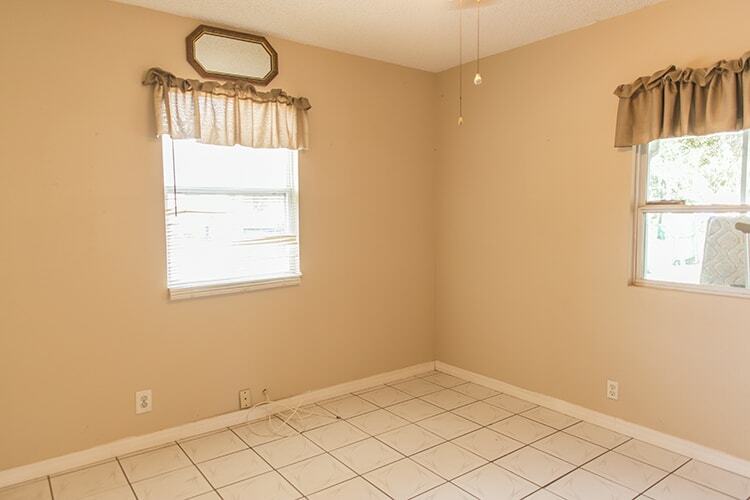 I’m not sure what they used this space for (maybe a dining room?) but we believe that it’s highest and best use is a third bedroom. 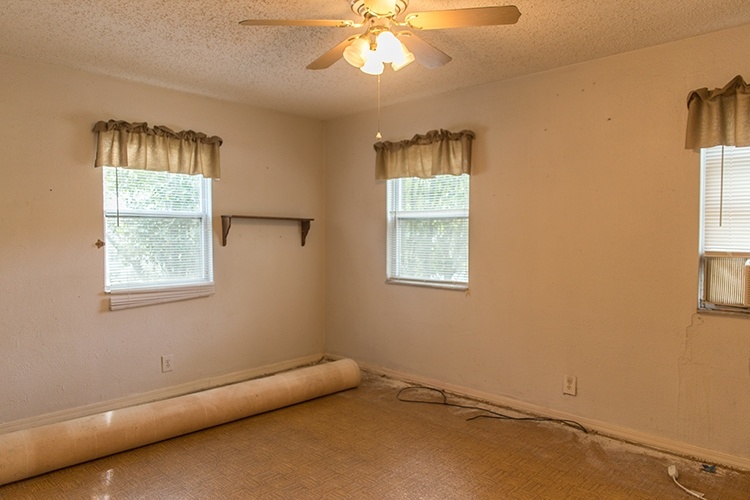 We’ll close up the 4th wall, add a door, and switch the wall on the master bathroom closet so that it’s accessible from this room. 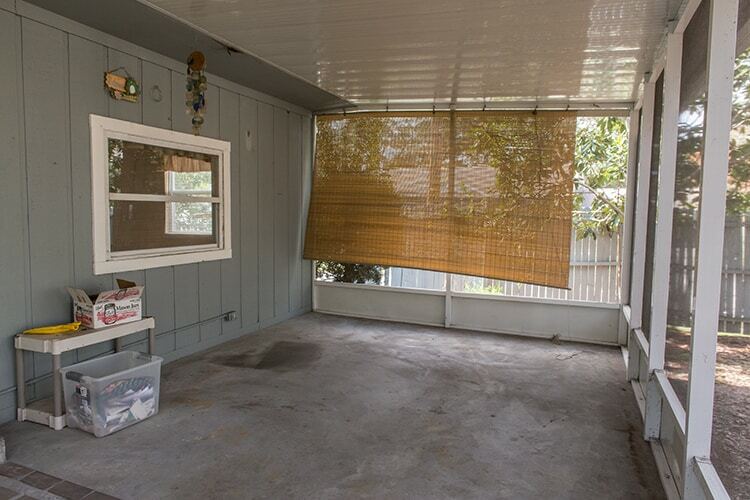 Finally, we have our sunroom. Haven’t quite figured out what to do here yet, but the options are limitless! I know that I at least want to replace the back door with a set of glass french doors. Can’t get enough natural light and backyard views! And there you have it! 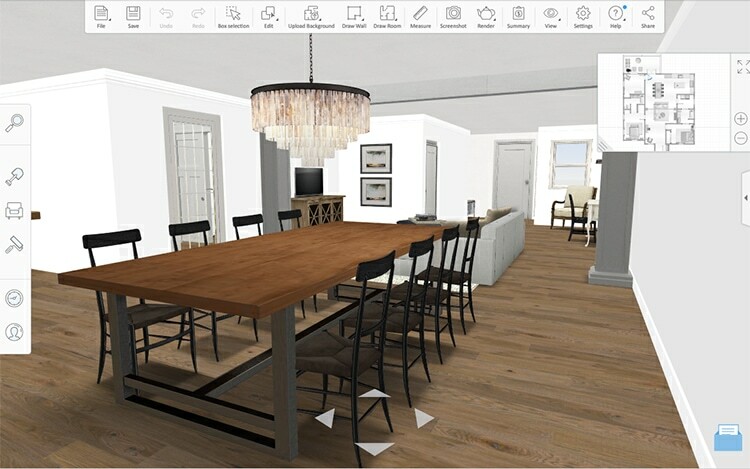 Aren’t these 3D renderings total game changers? 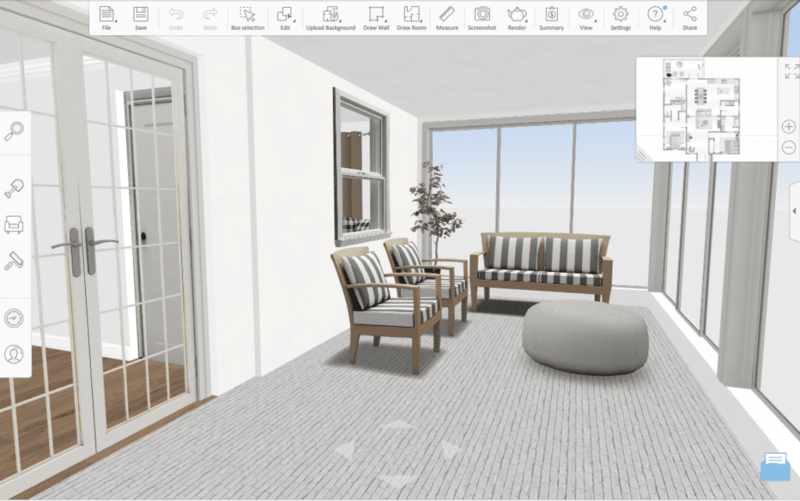 Lucas and I spent hours and days arranging and rearranging, even changing the floor plan a handful of times, thanks to this software. It has certainly helped us to decide the best use of space, and it’s really great for figuring out furniture sizes. I just wish there were more options for colors, styles and products, or the ability to import your own. Then it would be perfect! The day this is published we’re supposed to be doing another walk-through and inspection of the 5-unit bungalow (can you believe we’ve been under contract for 3 weeks and still haven’t been able to see one of the units?!) so fingers crossed all goes well there. 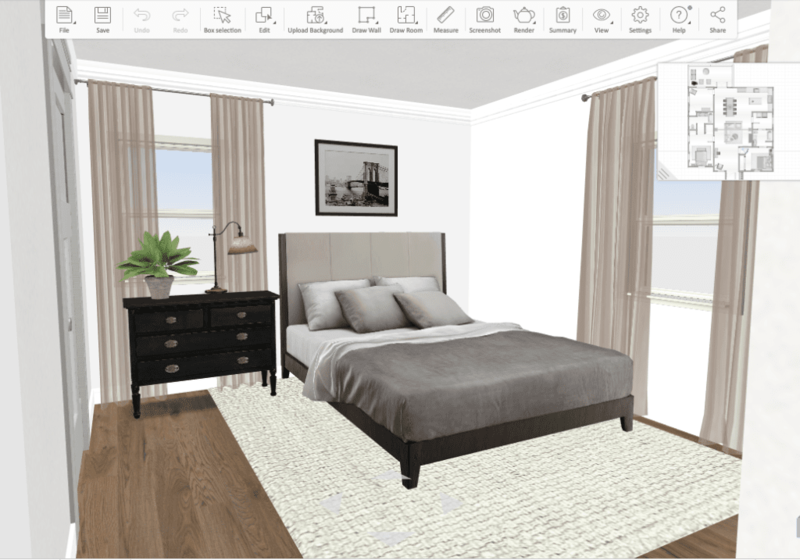 HOLY SH*T. You’re an interior design Goddess! 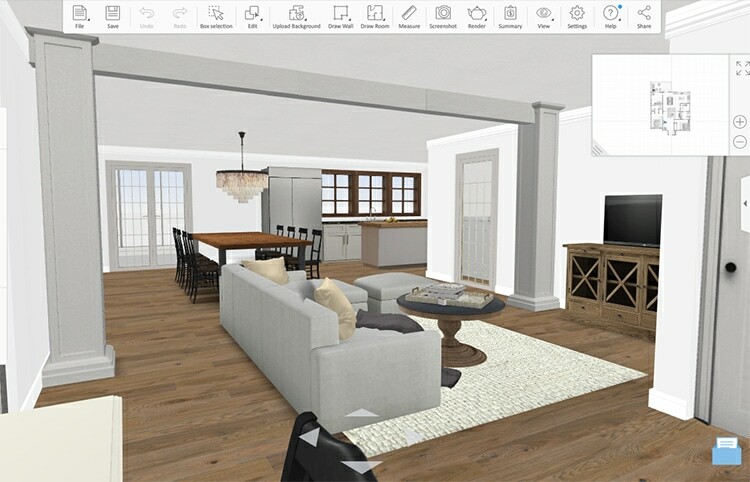 I couldn’t have envisioned such an amazing transformation of floor plans in my wildest dream. So excited for everything you do. You have no idea how any time you post is the highlight of my day. 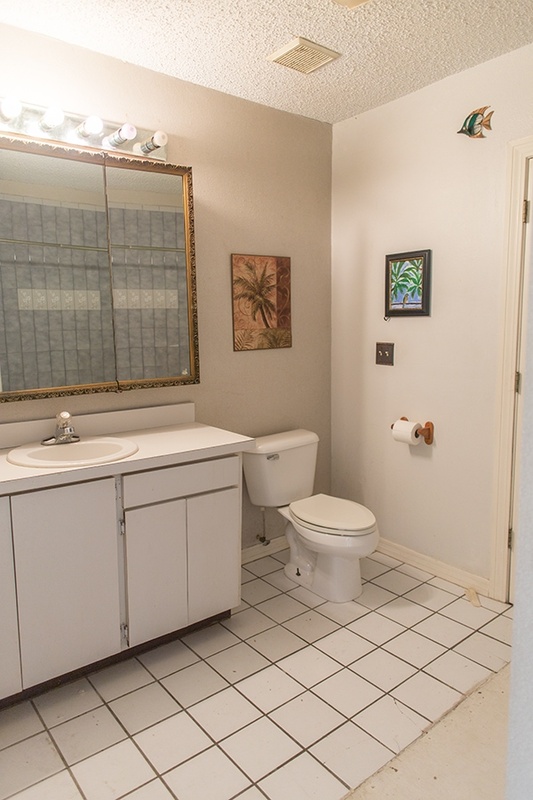 The bathroom situation seems a bit weird for guests coming over for the day to walk through either your pantry or guest bath to use the restroom. 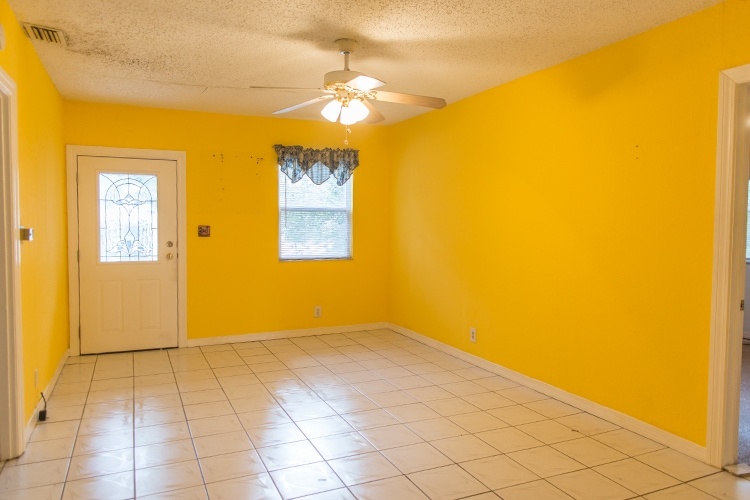 Plus, your third bedroom has to go across the house to use the other guest bathroom. I’m wondering if it would make more sense then to move the bathroom door for the bedroom with the bathroom to the living room area so the 3rd bedroom users doesn’t need to walk through bedroom#2 or the laundry room to access the bathroom. If we did that there would be nowhere to place the TV in the living room — at least without completely changing the layout and taking space from the dining room, which we’d rather not do. 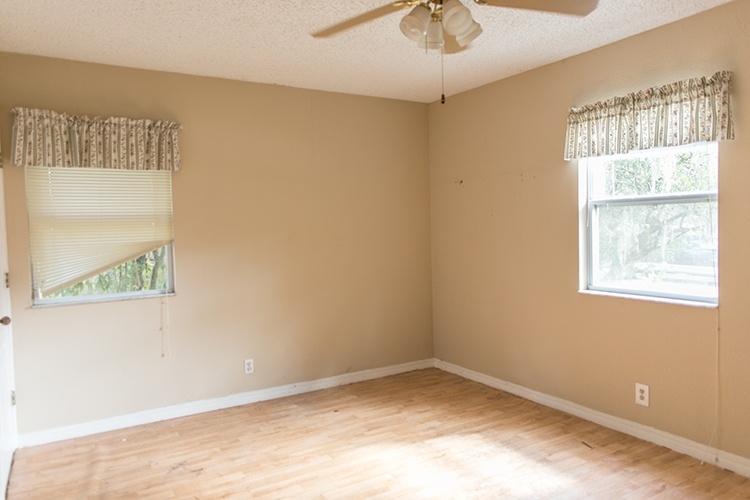 What about swapping the living and dining rooms? The table could be where the sofa is in the current design and the TV could be on the wall across from the laundry and kitchen? No matter what you do, I’m sure it will look amazing! 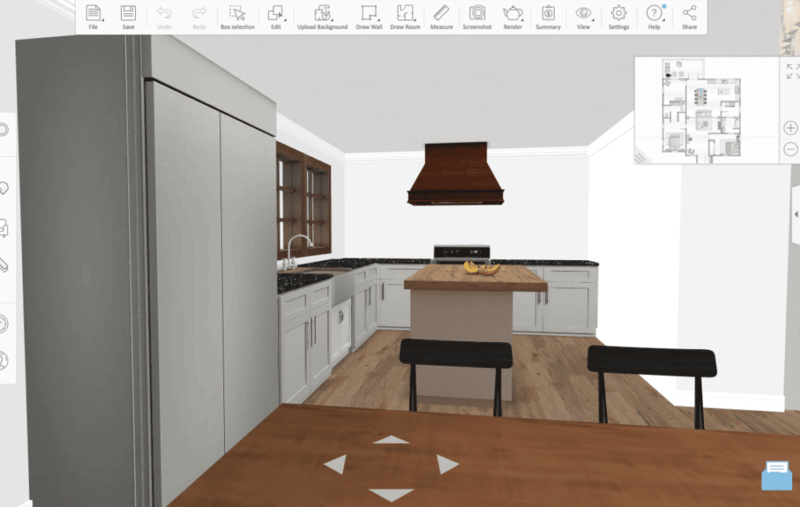 Hi Lindsay, we considered that, but think it’s more practical to have the dining room closer to the kitchen! Definitely an improved plan for sure! The sofa centered under the beam feels a bit awkward. Can you push the beam into the attic and conceal the columns in the walls? Or you could add two additional beams at the other wall jogs to help define the spaces so the center beam doesn’t feel out of place? Hi Liz, unfortunately the roof above it is completely flat so there’s no way to conceal it! I was bummed when we first found that out, but we tried to make lemonade from that lemon 🙂 We did consider adding a couple more beams, but those suckers are expensive, and we really fell in love with the vertical column idea! But there’s always room to make adjustments as it comes together. Hi! I’ve been constantly checking for updates on this project and am so excited and grateful for all of the information and honesty embarking on this. I genuinely wish you guys both a lot of success! 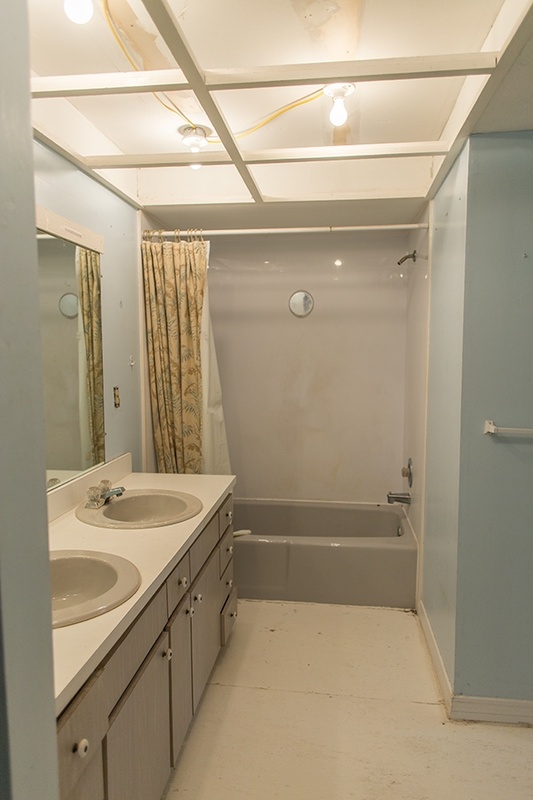 I had a question – how did you end up deciding to have access to the second bathroom through the laundry room? From what I can tell, it will not be accessible unless through the laundry room and am curious why you chose this and if it will come across as a negative. I don’t think it’s a bad decision at ALL, just genuinely curious about reasoning and thought process since it’s not the norm. Thank you again for documenting all of this! I can see it! I can’t wait to see your plans unfold and the finishes & decor you select. I second Kelsey! Best of luck in the challenges & successes ahead! As always, thanks for sharing. 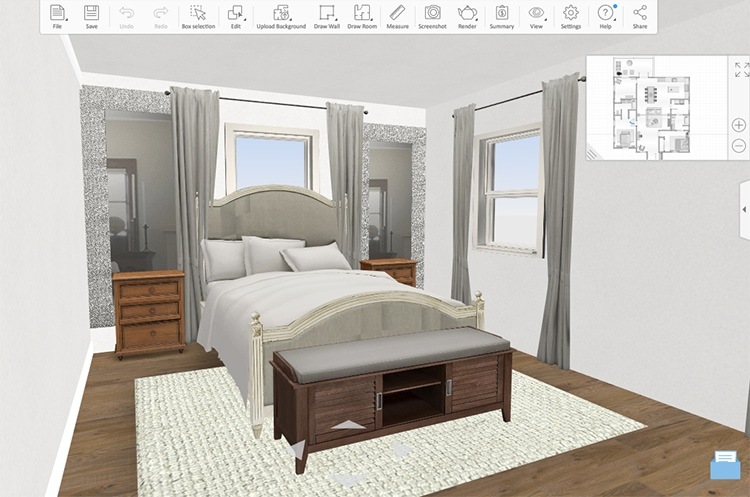 I loved following along as you traveled the world, but am SUPER excited to have you back sharing design and remodels! You are such an inspiration, and incredibly talented! 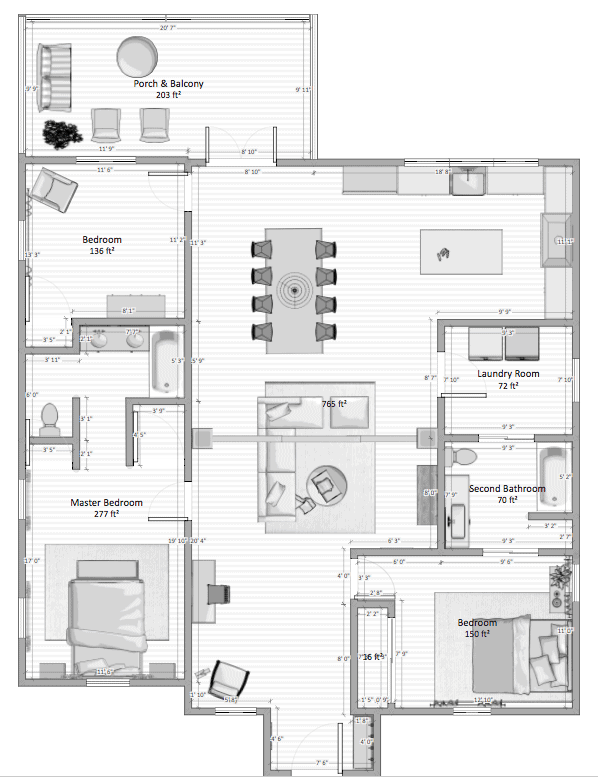 Do you mind telling me what program you used to create the floorplan, the one with all the measurements? Thank you! I am sorry – I swore I read the post, and then re-read it looking for any info on how you made the layout. Thanks again! Ditto! 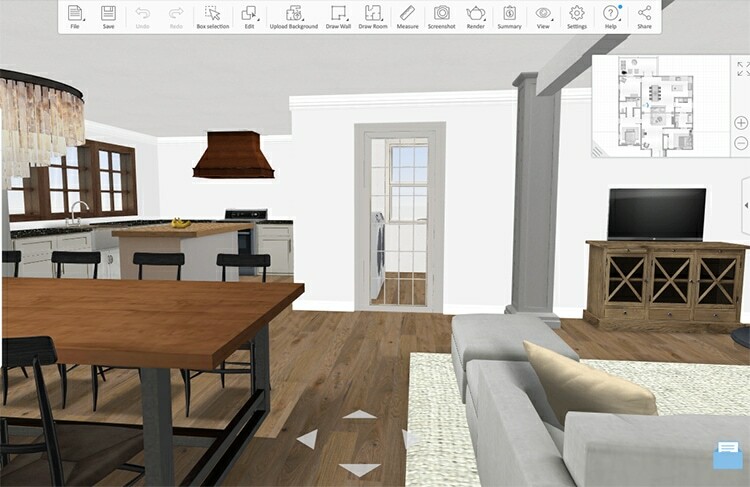 I’d love to know what software you used for the floor plans-not the 3D rendering-but the before and after layout of the space marking interior and exterior walls etc. I love that you guys are sharing this with us-thank you! 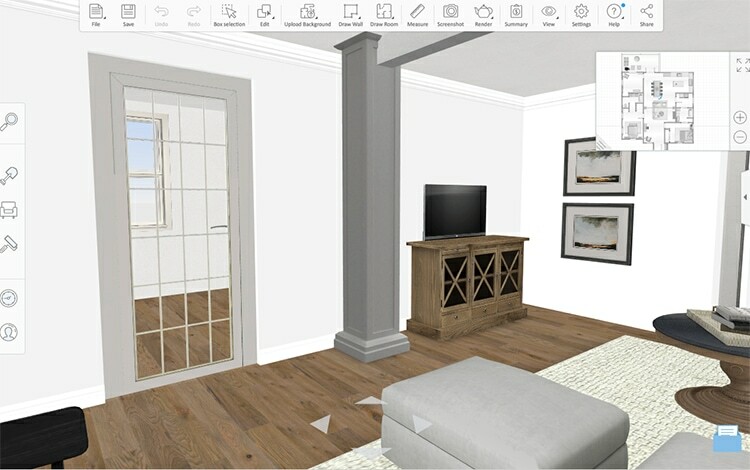 Hi Laura, that is in the Homestyler app too! I was wondering the same thing too Lindsay. So glad you asked. Wonderful designs ~ loved seeing the new layouts. Fingers crossed for you, that all goes smoothly. Thanks for the tour. Happy weekend to you both. WOWSA! Beautiful plan! Im excited to be able to follow you on this. While it was wonderful to follow your worldwide travels (and finding the love of your life) I have really missed following as you progress through a re-model. I think your plan makes the best use of space…and I know it will be terrific. Hugs to you both!! 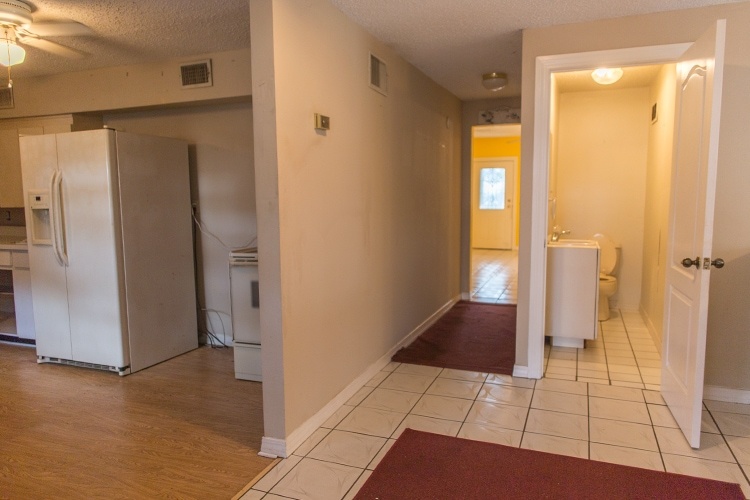 The floorplan is a big improvement, but I think the bathroom access through the laundry room and the decorative post location is too compromised. Say you need 9″ of bearing at each end of the post, I would push it into the wall and the other rooms. 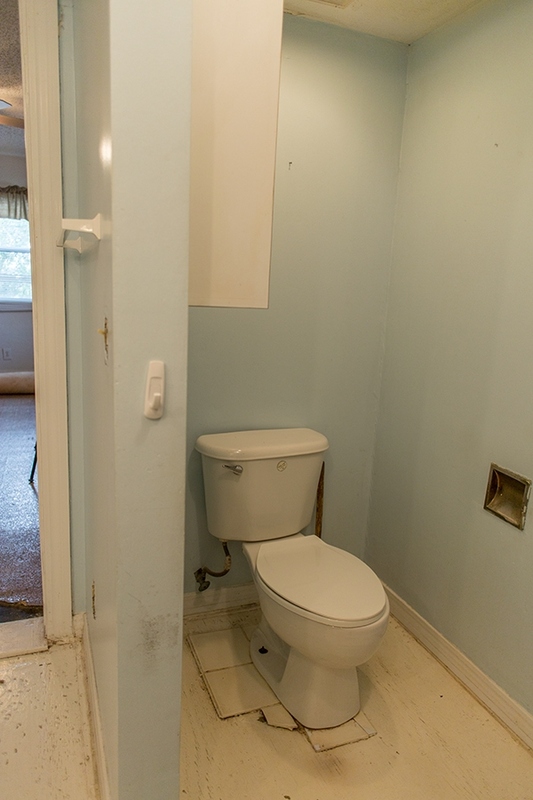 On the bathroom side, this looks like it might be completely buried in the wall, or easy enough to shift that wall so it would be. In the master closet, it might stick out 5.5 inches, but that seems a better compromise to me. 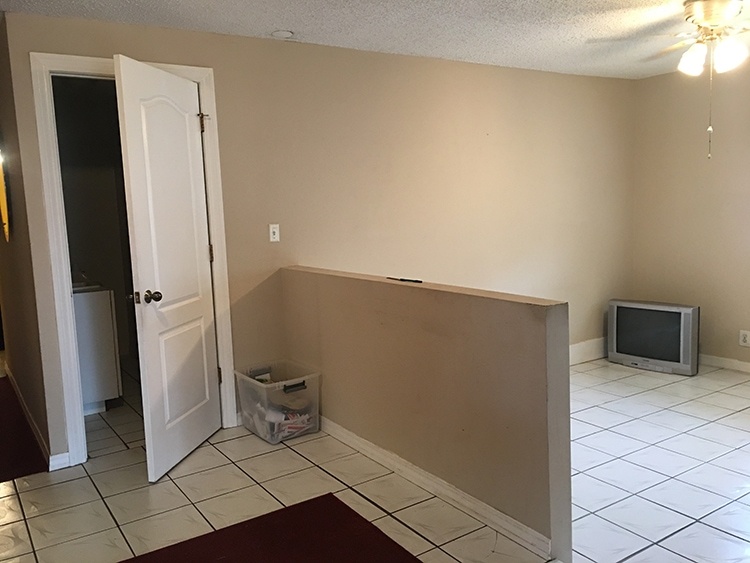 In the living room, you’d then have flat walls where you could mount a tv and still have space for a bathroom entry without passing through the laundry room. Failing that, switching the laundry and bathrooms would seem a better option to me. Hi Jenica, that is an option that we can still consider after we move in! We aren’t planning to spend any money on the bathrooms/bedrooms right now, so it wouldn’t be a big deal to move the door later on if we decided to do that. I know you’ll be flipping houses but is this one you’ll flip or will it be your home to live in? I am so excited to follow along with you on this new adventure! It’s interesting that all the bedrooms are accessible from the main living spaces as opposed to hallways. That will help maximize the square footage, but I wonder if sound will be an issue. We have a hallway separating our bedrooms from our open family room/kitchen, but sound still clearly carries. One question- did you consider making the master bath a Jack and Jill accessible to the living room? You could close off the smaller bath and turn that other front bedroom into the master suite (although it would be smaller than the current master). 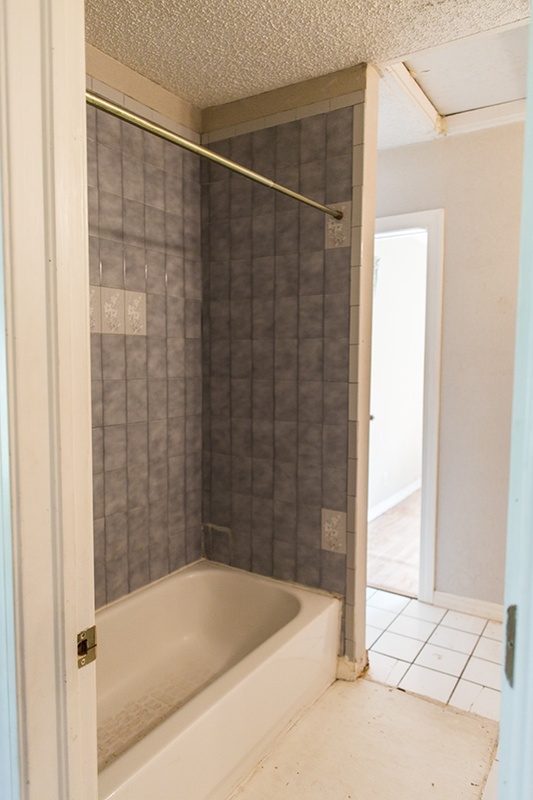 I would remodel the master bath, and have a door where the bathtub is into the main living space. actually, i change that, i would take out the master bedroom closet and make that into the door into the bathroom next to the tub (making the bathroom bigger), and the bedroom would have one closet instead of two. 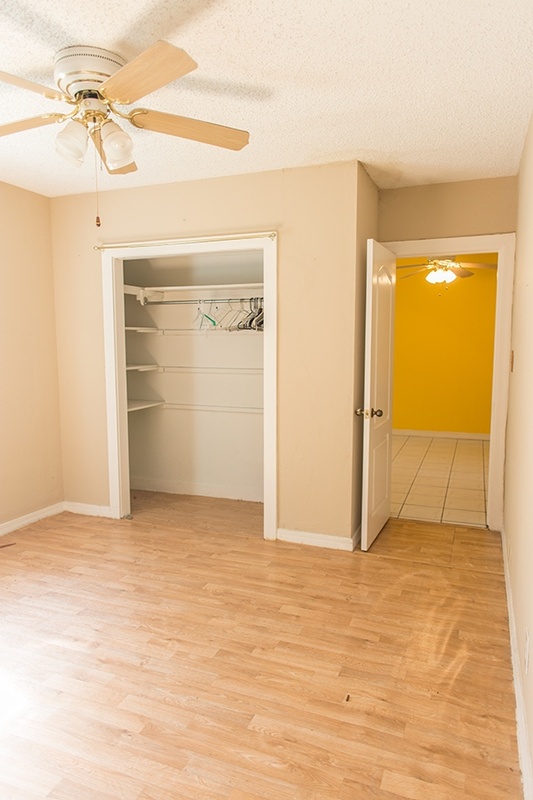 Just a thought, it seems weird that the third bedroom has no access to a bathroom. People would need to get up go through the dining room and kitchen and enter the laundry room to access the bathroom. 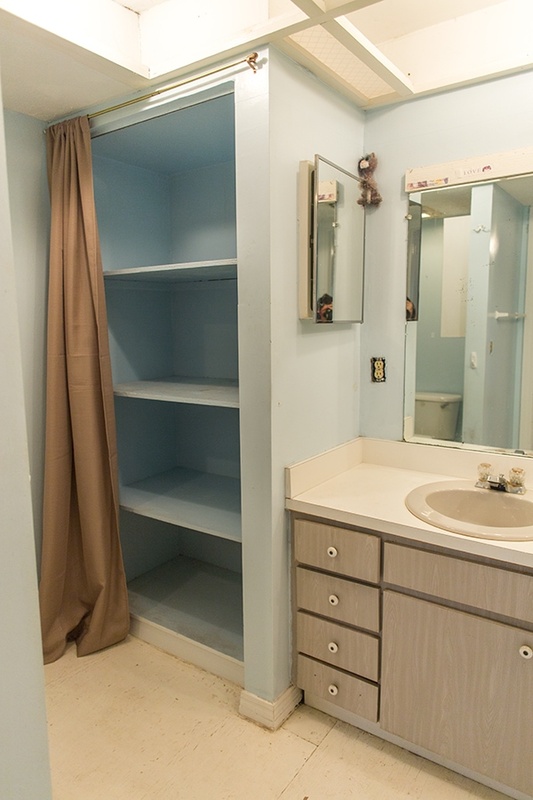 If you moved the closet to the back left corner, you could turn the existing closet into a bathroom entrance and have a jack and jill bath. Then make the bedroom on the front right the master. Seems that might be more practical and better for resale. 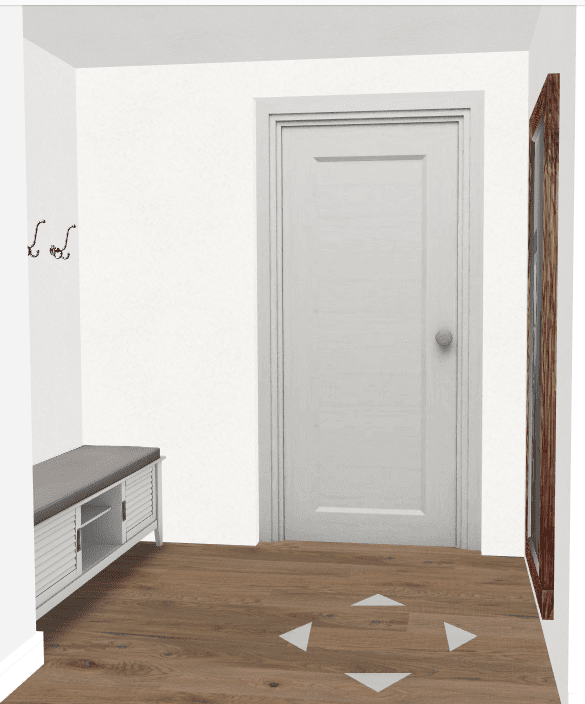 Cost would be minimal as you only need to demo the closet, add a door and frame in a new closet. Thanks Kimberly! Someone else suggested the same and it may be an option, but several reasons against that 1) there will be a header where the new door would be in the closet, which may not allow room for a door (the ceilings are shorter than normal) 2) closet space is quite limited already and we’d prefer to have a larger master, and 3) the likelihood of anyone staying in the 3rd bedroom is pretty slim, as it’s just the two of us and we already have a guest room & no family nearby, and 4) it’s literally 20 feet to the bathroom from across the house, totally not a big deal 🙂 But we aren’t planning to touch any of the bedrooms or bathrooms until after we move in, so at that point we could always make changes if the proposed layout doesn’t work for us anymore! I love the ideas!! Can’t wait to see how it’ll actually look like when it’s done! I have to agree with everyone else. 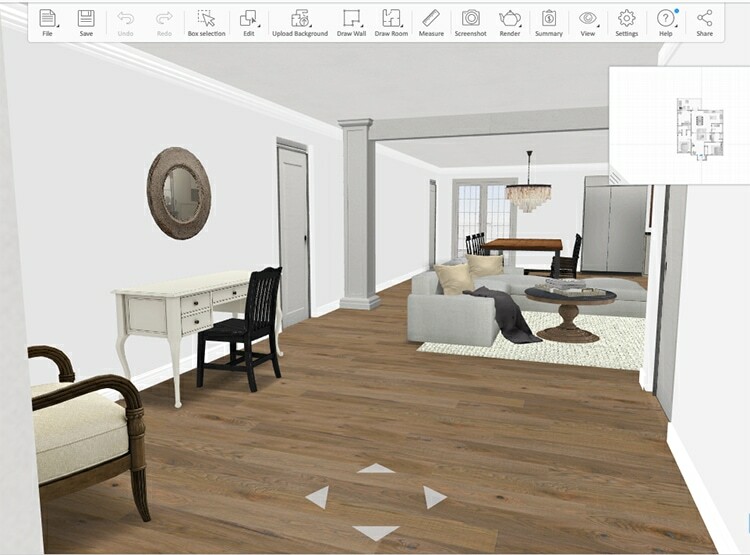 My first thought after looking at the plans was, “Where are guests going to pee?” I agree with another commenter who suggested making the master closet smaller and adding a door there to access the bathroom from the family room. I’m not going to comment on the bathroom 🙂 Older houses are quirky and have charm, and a 1940s house in Florida is considered somewhat old. I have no doubt you’ve thought and run multiple ideas through that app and this will be great when it is finished. LOVE the location and can’t wait to see you weekly updates. I use Homestyler too! My biggest complaint is the lack of decor and finishes 🙁 but the spacial planning is great. I was hoping they had done some serious updating to their catalogs! But alas, it’s not so. At least you can adjust the dimensions on the furniture now. You couldn’t before. Ugh. 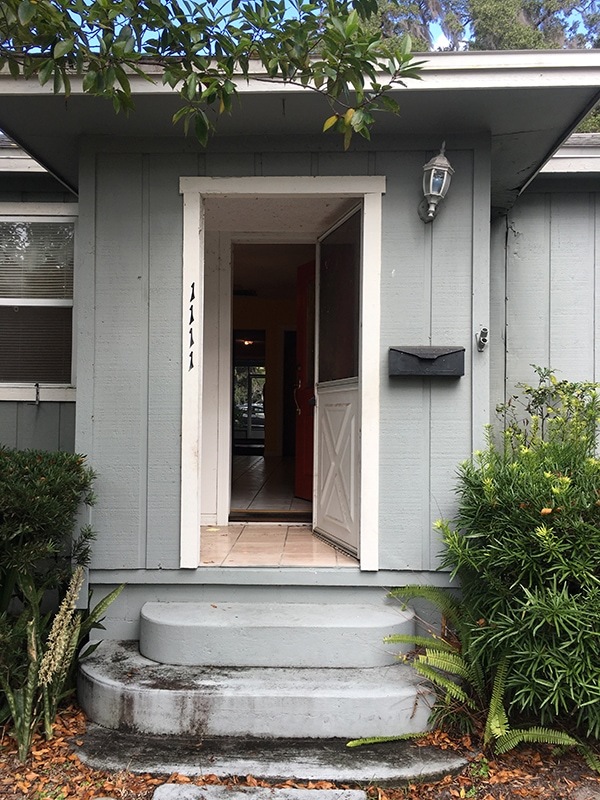 Ok, goofy comment here – I love your house numbers! I might buy it for that alone. You’ll never forget your address.